Pro Kabaddi League 2018 action carried on at the Vizag leg of the competition as the last day of the inter-zone challenge week had the Tamil Thalaivas battle it out against Jaipur Pink Panthers at the Rajiv Gandhi Indoor Stadium, Vishakhapatnam. Tamil Thalaivas came into the match after a close loss against the Dabang Delhi KC side in the Delhi leg a few days ago. They had won just one match out of their last fixtures and hoped to get a win over the Panthers to rise in the standings in Zone B. The Jaipur Pink Panthers were in a similar position in Zone A as they stood bottom of the table with three wins from fourteen matches. They hoped to get a win to boost their morale ahead of their home leg in the coming week. Jaipur Pink Panthers picked up a much-needed win over the Tamil Thalaivas after strong performances from Deepak Niwas Hooda and Sunil Siddhgavali. The first half of the match started off as a closely contested affair with the defence of both the sides keeping the raiders in check. 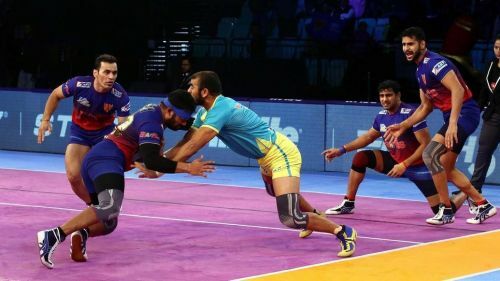 The two left corners Sunil (Tamil Thalaivas) and Sandeep Kumar Dhull (Jaipur Pink Panthers) were in good touch with their ankle holds and blocks as the scores were level for the most part. However, the Pink Panthers picked up a couple of good tackle points to get Ajay Thakur and Manjeet Chillar out in the final five minutes. A stunning five-point raid from Deepak Niwas Hooda saw him escape three defenders and get the all-out as Jaipur Pink Panthers led 17-10 at the end of the first half. The second period saw the Pink Panthers maintain their lead over the Thalaivas with clinical raiding from the Jaipur raiding unit. Jaipur got another all-out on the Thalaivas and took a sizeable lead and won 37-24 in the end. The Tamil Thalaivas skipper had a tough time in the first half getting just one raid point and being tackled two times by the Jaipur defenders. He could add only one point in the second half as he capped off a disappointing night on the mat. The second raider of the Tamil Thalaivas lineup went about his raiding duties picking up a couple of touch points and bonus attempts to score four raid points in the first half. He finished as the top raider for the Thalaivas with six raid points. The veteran raider started for the Thalaivas after a couple of appearances off the bench. He started off the match with a touch point. He added a couple of bonus points in the second half to end with three raid points. The experienced all-rounder had a poor first half, failing to get a tackle point in four attempted tackles and even being tackled during his lone raid in the half. He was benched in the second half of the match. The right corner Amit Hooda had a good night in the Tamil Thalaivas' defence as he put in a couple of strong tackles on the Jaipur raiders. He finished with three tackle points. The cover defender had a decent outing tonight in the Thalaivas' defence getting only one tackle point but was a good supporting figure with his assists to fellow defenders. The left corner defender Sunil replaced D Pradap in the lineup and started the first half with a strong statement picking up a couple of tackle points. He scored three tackle points in the end and was a strong presence in the Thalaivas' defence. The Kenyan raider came on in the second half and did brilliantly using his strength and agility to pick up five quick raid points including one bonus point.